Afghan parliament: Taliban claims responsibility for attack on Parliament in Kabul Monday. An Afghan security official at the site of an attack in front of Parliament building in Kabul on June 22, 2015. Taliban militants attacked the Afghan parliament, sending lawmakers running for cover in chaotic scenes relayed live on television. The Taliban has claimed responsibility for an attack Monday on the Afghan parliament building in Kabul, the BBC reports. A member of parliament told the Tolo news agency that lawmakers were evacuated without injuries, while the United Nations Assistance Mission in Afghanistan tweeted that a woman and a child were killed and 40 other civilians were hurt. Attackers detonated a huge car bomb outside the gates, stormed the compound, then entered a building next to the chamber. Police evacuated the premises, while trying to fight the gunmen off. The spokesman for the interior ministry, Sediq Seddiqi, said the gunmen had attempted to storm the parliament building itself after the gates were breached by the suicide bomb. Following a two-hour firefight with security forces, seven assailants were left dead, according to the Los Angeles Times. Harrowing video, taken from an Ariana News broadcast of Monday’s parliamentary proceedings, showed the body’s speaker, Abdul Rauf Ibrahim, “unfazed” as legislative chambers filled with smoke or dust after a loud explosion. Afghanistan’s legislative session, which had been set to expire Sunday, was marked by the failure to finalize a power-sharing agreement among the political parties. President Ashraf Ghani issued a decree extending the session, but the move was criticized as possibly unconstitutional and a breach of promises to donor countries to reach an agreement before the session’s end, the New York Times reports. 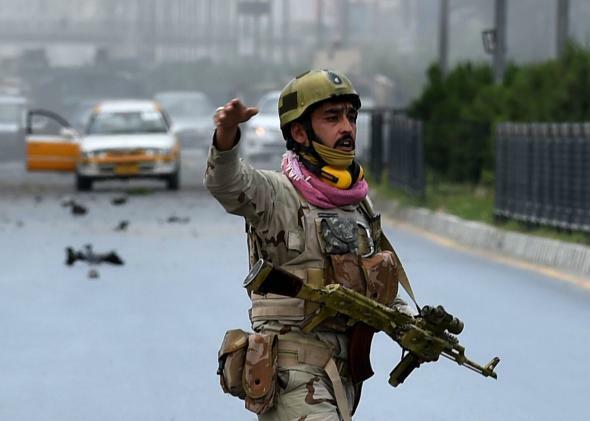 The attack on Parliament came as the Taliban reportedly gained control of Archi, an area in the country’s north that borders the regional capital of Kunduz, Afghanistan’s fifth-largest city.